Brexit continues to divide us. Exit negotiations will be fierce and the differences on what we should aim for, and how, are very deep. They divide our politicians and our society. With a hung Parliament, there is an understandable temptation for every difference to become a vote of confidence, a seeking of momentary advantage ahead of the next election. …we need the politicians to find a way of neutralising the temptation to take minor advantage domestically from these great events. We must develop a forum or commission or some political tool which can hold the ring for the differences to be fought out, so that a commonly agreed negotiating aim is achieved. Obviously it would be under the authority of Parliament, especially the Commons. It would need to be cross-party and chaired by a senior politician, on Privy Council terms. It could not bind Parliament, but well-structured it could draw much of the poison from the debate. Justin Welby’s motives are honourable, as ever: the Brexit debate has become poisonous to society, so politicians must focus on national reconciliation and the “common good arrived at through good debate and disagreement”. His exhortation is unarguable: “Let us do everything we can to ensure the right values are at their heart.” But there is in his proposal for a cross-party commission a certain political naivety, if not a simplistic Christian idealism, which underestimates the potential apocalypse or miscalculates the future imperative. A commission cannot produce unity of aim any more than a parliament can impose harmony on society. Parliament is an expression of a pre-existing national unity: the minority accepts the will of the majority, and the rights and liberties of the minority will not be infringed by the majority. That is the social contract. A commission which is divided at the outset by fundamental definitions and understandings of meaning is not only destined never to report; it is anaesthetised to reason. If its objective is to “find a way of neutralising the temptation to take minor advantage domestically”, it would be paralysed at the outset in trying to distinguish partisan “minor advantage” from the majority will of the people. Is ending free movement of people a partisan minor advantage, or is it intrinsic to the Leave thesis? The neutralising of political temptation soon becomes the nullifying of the democratic voice. The outcome of the EU Referendum was for the UK to leave the European Union. It may have been close at 52:48, but a win is a win. You can bet your bottom Scots pound that if the SNP had won their Independence Referendum by that margin, Scotland would be leaving (or would promptly have left) the UK, lock, stock and rejoicing Glendronach barrel. Indeed, if that referendum had been won by 1000 votes, or 100, or even just 10 votes, there may have been a dozen recounts, but Nicola Sturgeon would have piped down Princes Street from dawn ’til dusk until the democratic will of the Scots had been realised. There would have been no debate over ‘hard’ or ‘soft’ Scottish secession: independence would have meant independence. And the Kirk would not have proposed some mediating commission to “draw the poison” from ongoing division: the people would have spoken; let’s just get on with it. Some 1,269,501 more people voted to leave the EU than remain in it. Of the 16,141,241 who voted to remain, a vocal contingent (a very vocal contingent) is intent on overturning the result of the referendum under the pretext of ‘soft Brexit’, which is to say that we will leave the the EU (“We accept the result of the referendum”), but remain in the Single Market and the Customs Union, and so subject to the edicts of the European Court of Justice (and unable to negotiate trade agreements independently). It is not clear, then, in what sense we would have left the EU, since the EU is super omnia its institutions and laws. If we remain in them and subject to them, parliamentary sovereignty would still be compromised, and the people would not have taken back control (indeed, they would have been thwarted from doing so). The Brexit poison does not derive from the result of the referendum, but from the dogged refusal of certain powerful and prominent agitators across the Establishment – the political, legal, financial, aristocratic, ecclesial, media and academic elites – to accept the lawful outcome. There is no consensus on the way forward because of this fundamental denial of democracy. Those who repudiate any notion even of ‘soft Brexit’ argue for a second referendum ‘to make sure’, with some now even making the case for a super-majority. Those who repudiate a second referendum argue for Parliament to decide (ie the Commons and Lords combined, among whom the majority favour remaining, as all elites do). The onslaught against Brexit is relentless, and is epitomised by the duplicitous crusade of Gina Miller and the increasingly deranged ranting of Professor AC Grayling. “Yes, #Brexit is wrong. It must & will be stopped,” he tweets and tweets, again, again and again. A cross-party commission would not resolve this disconnect, not least because it would need to consist of representatives of all parliamentary parties (which unhelpfully excludes Ukip at the outset, but perhaps the Archbishop prefers it that way). The immediate problem then is that each of these parties is itself divided: does Kenneth Clarke represent the Conservatives on this Commission, or Iain Duncan Smith? Does Hilary Benn represent Labour, or Kate Hoey? You get the picture. There may be parliamentary unity of purpose in the SNP and Liberal Democrats – the principal Remainer parliamentary groups – but these parties also have politicians (members and supporters) who voted Leave. The proposal to summon a commission to “hold the ring for the differences to be fought out, so that a commonly agreed negotiating aim is achieved” presupposes a pre-existing unity of purpose which simply does not exist. Kenneth Clarke will never agree a negotiating aim with Kate Hoey; or Hilary Benn with Ian Duncan Smith. The prospect of the SNP agreeing a common Brexit position with the Conservatives is simply laughable: they will go on milking it for every drop of anti-Tory dissent they can in order to further their political super-objective. Such sophistry and incitement is intrinsic to democratic division, and has been since democracy was invented. To resolve the impasse (or to preempt deadlock), the strategy would be for parties to cram this commission with moderates (soft Leavers and Remainers who “accept the outcome of the Referendum”) to mitigate the extremes – a good old Anglican via media. But the outcome then could not be anything but an Anglican fudge – neither fully in nor properly out – and so the poison would persist in its malignant course, and the body would go on ailing. If democratic history teaches us anything, it is that when people are denied resolution by the ballot box they may resort to alternative means. And those means aren’t always predicated on peace and reconciliation. 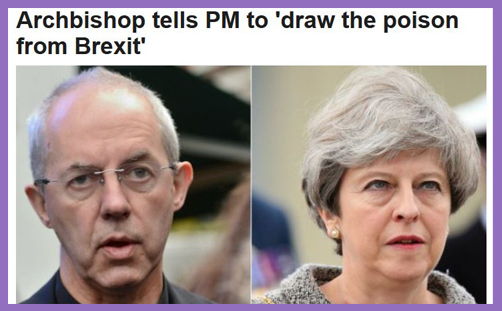 But the poison which Justin Welby seeks to draw from Brexit is not confined to that debate: it is the same bile which insists that Jeremy Corbyn really won the General Election and so Theresa May must be ousted, by fair means or foul. It is a contagion which emanates in the denial of democracy, and an aloof cross-party commission – even one subject to Parliament – would be perceived by many of those who voted Leave (and, indeed, many of those who voted Remain but now want to leave) as a mechanism for obstruction, obfuscation and perpetual frustration. A political commission cannot produce consensus when its members cannot agree the difference between darkness and light. Perhaps if the Archbishop had not only quoted half of the proverb, the way forward might have been clearer to him. ‘Where there is no vision, the people perish‘ is not a plea for politicians to set out their manifestos of hopes and dreams. It continues: ‘but he that keepeth the law, happy is he.‘ The context is man’s sin and rebellion, set against God’s law and judgment. It is inseparable from the Covenant relationship which YHWH established with His people: God is the God who revealed His name to Moses, and the fear of Him is the beginning of wisdom. He is made know not by political (or ecclesial) visions, but by divine revelation (‘out of his mouth‘ [Prov 2:6]). People are exhorted to acknowledge him in all their ways (3:6), or literally, to know Him, and (most importantly) His ways are not ours. Justin Welby’s plan is welcome (‘Every purpose is established by counsel: and with good advice make war‘ [20:18]), but man’s planning is subject to to God’s plan, which is supreme (‘There are many devices in a man’s heart; nevertheless the counsel of the Lord, that shall stand [19:21]). Democracy is by no means perfect, but it is a political mechanism which permits participation, accountability and change. If people participate but find that the ruling powers refuse to be accountable and so nothing changes, the poison which presently exists will be as nothing to the battle which will ensue. The vision without which the people will perish is that which denies prophetic revelation and revolution. This is a spiritual imperative. The law must be kept because it is the source of peace and prosperity – or happiness. This is a moral imperative. But ‘The heart is deceitful above all things, and desperately wicked‘ (Jer 17:9), and that, with enormous respect to the Archbishop, is the source of the poison in Brexit and, indeed, the venom in all our politics. You cannot draw the poison from Brexit without extracting deception from the hearts of those who misrepresent it or seek to thwart it. You cannot draw the poison from Brexit without denying the deceptions and divisions inherent to a functioning democracy. The glory on the mountain will not be found in a contrived cross-party commission, but in hearts which are reconciled to the pre-existing unity of the collective wisdom of democracy. The alternative is a tyranny too fearful to contemplate.